ArchiveIndex+ provides an easy to use and flexible system that supports the progressive cataloguing of document archives. 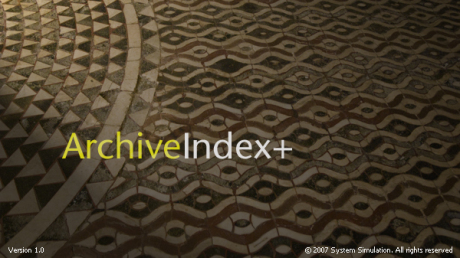 ArchiveIndex+ is an attractive system that can provide archive management in a stand-alone configuration or as a module in conjunction with System Simulation's other software for managing the range of collections held by cultural institutions - archives, objects, books and images. The user interface of ArchiveIndex+ is a Windows desktop application. A key feature of ArchiveIndex+ is its flexibility. Its hierarchical record structure allows (unlimited) multiple levels that can easily be re-organised with drag-and-drop facilities, while powerful search capabilities provide easy access. This flexibility is carried even further with easy cross-referencing to other collections, when ArchiveIndex+ forms part of the general collections package. ArchiveIndex+ has been developed in conjunction with professional archivists in order to assist them to carry out their day-to-day tasks as efficiently as possible. The system is an imaginative implementation of the ISAD(G) standard that recognises that the management of archives requires the organisation of papers and documents in a hierarchical structure, allowing increasing detail at each level. ArchiveIndex+ provides for the easy creation of variable levels, including the 6 level structure, from 'Fonds' to 'Item', that is to be found in a classic ISAD(G) implementation. Such an approach allows work to be concentrated on priority areas, while maintaining the integrity of the whole archive. Furthermore this structure can be modified as cataloguing progresses through an intuitive tool called the 'Organiser'. This tool, with simple drag and drop facilities within a familiar hierarchical tree structure, allows categories at different levels to be re-allocated. It is supported by useful features, such as the automatic generation of reference codes. Behind the intuitive user interfaces, ArchiveIndex+ makes good use of System Simulation's well-proven database technology and terminology systems. Powerful search facilities range from free-text to highly structured searching, while other approaches allow, for instance, a previous search logged in search history to be modified and made more specific. Accuracy and consistency are delivered by multi-level thesaurus hierarchies that are easily managed through a graphical display with drag-and-drop organising facilities. Of course, editing and other rights are controlled through a permissions system, configured according to institutional circumstances, while overall management of the system is facilitated through the generation of reports, also configured to suit institutional circumstances. Access to the archive data can be provided through the network , through intranet and internet systems or through an OAI gateway.